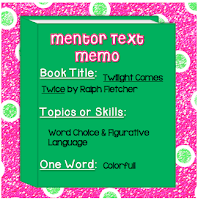 Pinkadots Elementary : Sunday = Funday, Mentor Text Linky: Twilight Comes Twice! 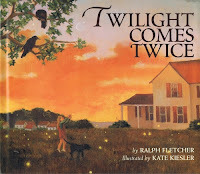 Sunday = Funday, Mentor Text Linky: Twilight Comes Twice! What image do you have when you think of twilight? Dusk, dawn? Both? This book uses free-verse poetry to capture the inexplicable essence of these two special times of day. Since I only teacher Reading/Writing/LA I do a lot of reading. I consider myself a book-aholic. My students love listening to read alouds on our reading rug. One of my colleagues loves reading books even more than me. I think she knows every book ever written and can tell you the title and a summary when asked. Her thirty plus year of teaching sure help this matter. When our PLC decided to focus on word choice this year, the colleague introduced us to Twilight Comes Twice by Ralph Fletcher. Not only is the imagery amazing, but there is other figurative language used throughout the book as well. A few years ago, Mr. Fletcher came to our school to speak to the students about how he got started as a writer. It was an inspiring presentation to the teachers as well as the students. Earlier this year I came across a phenomenal demo reading of Twilight Comes Twice. The reader's voice and tone is perfect, and I love the sound effects in the background as the gentleman reads. As much as I love reading this book and stopping to look at the beautiful illustrations, I think this video does the job just as good as me. So if you don't have the book, the video would be great to show your class!